I finally received my copies of the Knit Now issue in which my patterns were published. It's rather fun to see my patterns in this format: the little booklet is lovely, and the perfect size to fit in a knitting bag. I'm also looking forward to browsing the magazine, to see if there's any projects I'd like to knit. They were generous enough to give me several copies. One I will keep for myself, and a few will go to my fabulous test-knitters, who help me without much compensation (maybe because they're my cousins). And I have one copy to give away to some lucky blog reader! Inside a plastic sleeve you'll get a copy of Knit Now issue 24, the Woodland Friends booklet, a baby blanket pattern, and a set of cable needles. If you'd like to enter, please leave a comment here with a way to contact you (you'll have to write out your email address because blogger doesn't let me contact you via comments, but disguise it a bit if it makes you more comfortable). I'll cover the shipping cost to you by regular mail, anywhere in the world. The give-away will be open for a week, and I'll choose a winner by random number next Friday morning, August 16. Congratulations to colindabeertje! I'll send the magazine off to you on Monday, and I hope you enjoy it. To everyone else, thank you so much for leaving your lovely comments. Somehow I forgot to write about this here, perhaps summer just got the better of me. Anyway, I have a bit of time this morning to tell you about one of the projects that kept me busy this past spring. I was asked to put together a selection of woodland animals patterns for Knit Now magazine. Having never been published in a magazine, I thought it was a great opportunity. While it was a lot of work in a short amount of time (something I haven't done in ages), I learned a lot, got to work with some lovely people, and did something I'd always wanted to try. Most of the patterns included are ones I'd already published: a selection of the Wee Wuzzies, and the Owl and Baby (slightly altered, so the Owlet would actually stand). 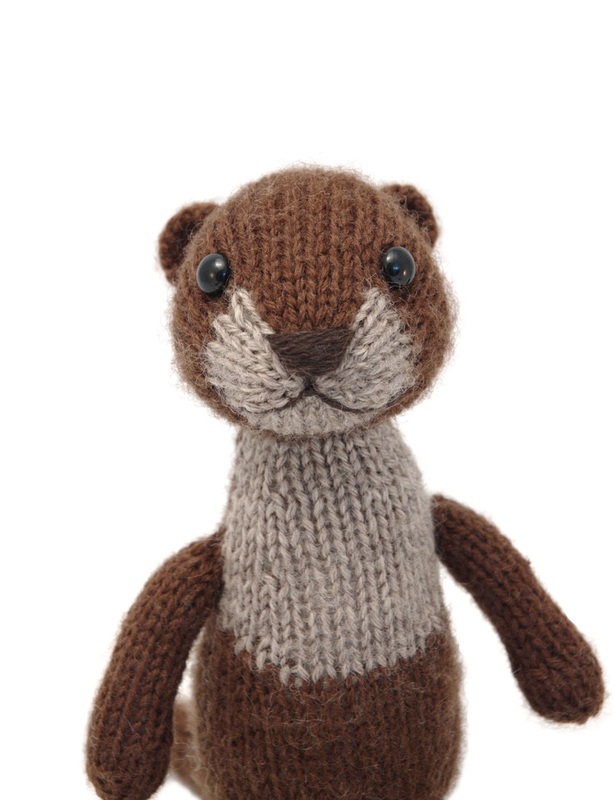 I also designed a new toy that I'd had in mind for a long while, a River Otter! I haven't seen it in print yet, but I'm sure it's lovely, and I really hope knitters in the UK are enjoying the magazine. I should be getting a few copies of the issue, and will hold a give-away for one, so check back soon!